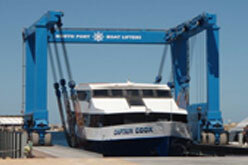 Crib Point Engineering design and manufacture Marine Straddle Carriers. These Carriers can be either designed to suite your application or a vast range of existing 'standard' machines already exist. 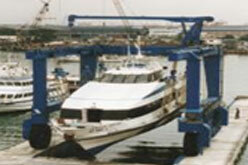 All hoist systems are fully independent. 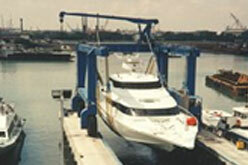 Machines Designed for ease servicing and long jevity. Two speed hoist and wheel drives available on all models above 40 tonne capacity. Live load weighing system on all models above 40 tonne capacity. Smooth efficient winch and transmission control. Winches fitted with dual fail safe system. Direct drive gear box and fail safe brake unit integral to winches and wheels eliminating chain slack and maintenance. Front and rear independent sling adjustment from the operators platform. Cross beam pivot bearing eliminating stress in frame when travelling over uneven ground. Frame constructed from prime grade certified steel. Frame sizes to meet boats of the 2000's. Underslung power pack for easy access. Hydraulic test points for fault finding. Components chosen for their quality and availability. Stainless steel components including hydraulic tubing, operator control panel, exhaust system, fasteners. Galvanised wire ropes for long life. 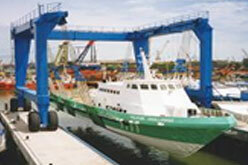 High performance zinc epoxy marine paint system. Engine Warning and protection systems. Closed circuit TV on request.